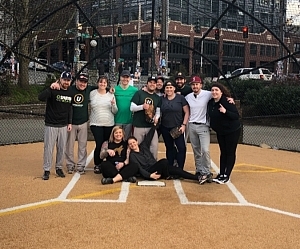 On a sunny March afternoon, Amanda and Friends completed a perfect season and took home the title in an 11-4 victory over Master Batters. Congrats to both teams on a great season. We are looking forward to seeing both of you in the future! Robert came up big on the most important weekend of the season. During Amanda and Friends 11-4 championship victory, Robert went 2-3 and showed off some of his power with a home run. Great season Robert! Katie Fuller had a big day for Amanda and Friends. On top of playing great defense, Katie also had a hole run which helped fuel her team to a 19-6 victory over Master Batters. Make It Rainier In Da Club!